Cody Lundin is a professional survival instructor, bestselling author and star of Discovery Channel’s hit show, Dual Survival. He’s based his life on living close to the land, being able to survive in any situation and ultimately doing more with less. Cody recently sat down with Conscious Connections’ Founder to share his unconventional housing choices, his work on Dual Survival and his philosophy of life without shoes. Anthony Chiaravallo: I’m curious to hear how you got started on the path of outdoor survival. In your show, you mentioned living the woods during your college years. How has that experience influenced you? 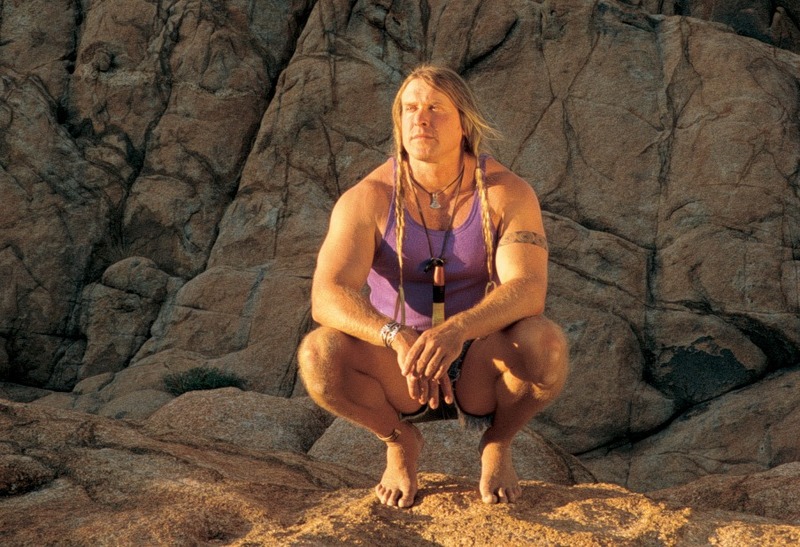 Cody Lundin: I chose to live in the woods in a place surrounded by national forest. I did it partly because I wanted the experience, but mostly because of financial reasons — I didn’t really have any money. I lived out there illegally so I had to stay hidden. I would go to college and ride my bicycle back out to my brush shelter, hide it in the trees, and then do my homework with two candles stuck on a rock. That was my life for a couple years. My home was a dug out foundation about two feet into the earth with a stone fire pit in the middle and a cone-shaped configuration of brush around that. It looked like a slash pile in a forest. Teaching outdoor survival happened, and this is going to sound unromantic, because I needed a job. I’d always grown up around nature because that was my constant companion. I’m an only child and my dad moved a lot because he’s military so my main friend was quite literally the outdoors. I always had a love for the backcountry and was already into survival skills so I pitched the idea to teach at the college I was a student at. Eventually I developed their primitive living skills program, which is taught there to this day. At the time, I lived in a yurt in a friend’s backyard. I literally ran a phone cord up the side of the mountain so my phone could ring to do business in my Mongolian tent. I knew a graphic artist who made me brochures that cost about $10. They went on telephone poles, storefronts and phone booths and that’s how it started. Anthony Chiaravallo: It’s inspiring to hear about how you started from nothing and built your career up over time all the way to a hit TV show, Dual Survival. What’s it like behind the scenes, when you’re out filming in the wild? Cody Lundin: Some things are produced, like all TV shows, and some things happen on the fly so we have to shoot out of order. Dual Survival is not a linear process. You have different elements coming in that are real, like rain or wow, there’s a snake down there, or wind or the fire goes out or something like that. But then you have a whole process of working parts, including different people and different laws. Well, I wasn’t going to jail because I made a fire in New Zealand. Anthony Chiaravallo: Tell me now about your self-reliant home. I think that will really resonate with our eco-conscious readers who would like to make their own houses more sustainable and efficient. Cody Lundin: I have a passive solar home, which means there are no moving parts. I just have my home pointed in the right direction for our hemisphere on the planet. I have solar cells and a complementary arrangement of insulation and orientation. What I try to stress to people is that you can have a very conventional looking home with all the benefits of sustainability without looking weird. It doesn’t need to look like my home. By doing the same things that I teach outdoor survival students, I have no heating or cooling bills in my home because I’m conscious about conduction and convection. I’m conscious about radiation, evaporation and respiration. There are only five ways the human body, or anything on the planet, whether it’s a chicken coop or a home, loses and gains heat. I’m passionate about trying to bring sustainability in its many facets to a more urban landscape because frankly, that’s where all the people are. If people can be wiser consumers and be aware of the resources they’re consuming then I benefit the planet more than by saying how to light a fire. Anthony Chiaravallo: I’d like to speak with you now about the connection you have with the earth, which is probably the reason you have gone barefoot for so long. Can you talk a little about your philosophy behind going barefoot? Cody Lundin: I noticed that a lot of indigenous peoples, sure they make moccasins and have sandals, but when they can they go barefoot. If you have to make your own shoes, you wear them only when you need to. I’m not saying shoes are bad and we should go barefoot. But I am saying that people go barefoot more than they have footwear. Then I noticed that one of the first things done to a Prisoner of War is to take their shoes. Why? So they can’t go anywhere, because they are dependent on their footwear. And I don’t like dependency. This was way before Born to Run and knowing about reflexology and the angle of the foot and how it is less damaging to the joints when you’re barefoot. I just wanted tough feet because it slowed me down. It made me pay attention and I thought it was a magical thing to do. I have strong feet, as you might imagine. I have strong tendons and ligaments in my ankle and I have strong lower legs. Why? Because I haven’t put my foot in a cast. I mean, if you kept your arm in a sling for years it would atrophy. And people wonder why they need high top boots and tight laces to get ankle support. They need ankle support because they’ve had a cast on their foot their entire life. No one seems to really get that. I’ve had a lot of clients who love barefoot shoes. I’m glad that people are using less ankle support because the body will compensate. That’s what the body does. It’s very good at getting strong when it needs to get strong. It’s called resistance training. It’s what everyone does at the gym. Anthony Chiaravallo: I totally agree, and actually go barefoot myself every summer since I live near the beach. Is there final any advice you would like to share with our readers? Cody Lundin: I’m living proof that you can do this. That if you follow your passion and don’t give up you can be successful doing what you want to do. In my case I just ate a lot of stuff and lived in backyards and didn’t have much money for years. But now I’m making a living doing what I love. It’s worth doing whatever we can to make this a better place and to be responsible stewards of our planet.